milked out, fuzzy & "fluffy"
Roulette is the spittin' image of her sire, with her pretty head, her intelligent, outgoing personality & her overall correctness. She’s not only easy on the eyes, but she’s also a joy to have around! She does tend to be a bit of a chunk, but once you get your hands on her, you're pleasantly surprised to find that she is actually "very dairy" with flat, open ribbing & soffft, pliable skin. Typical of the Dash daughters, she continues to improve as she matures & is developing into a fine example of the “total package” we are striving for in our breeding program. 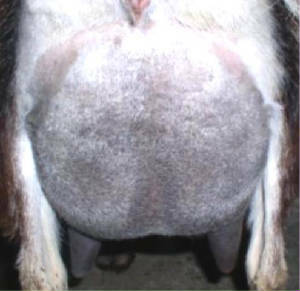 She stands on strong feet & legs, milks very well out of a lovely mammary while maintaining condition easily & holding a long, level lactation . . . - & she’s done pretty well in the show-ring, too! Roulette had a bit of a "Performance Anxiety" complex as a kid but on the two occasions she chose to behave in the ring, she made up for her past misbehavior . 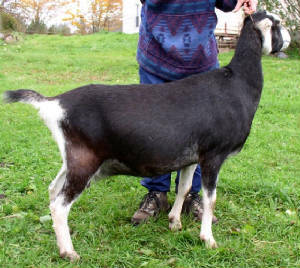 . . once, to win her class - even standing in front of her nearly unbeatable paternal sister, Rose Petal - & the other, at the 2003 Michigan State Fair, where she stood 3rd in a large & very competitive class of Senior Kids. She freshened with a marvelous mammary in 2004, kidding w/ twins x Jrufio. She milked off some of that baby fat & showed very well, winning her class all but twice for the 2004 season as a milking yearling. 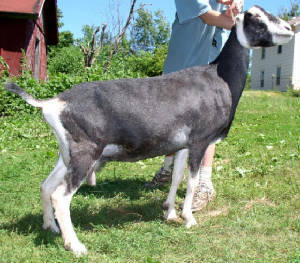 2005, she kidded with twins x Matrix & showed just as well as a 2nd freshener, usually topping her age class, w/ paternal sister Ceinwen right on her heels (& squeaking in front of her once, for the blue ribbon)! 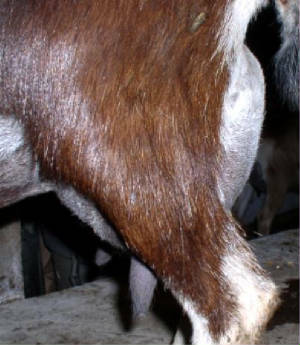 She also appraised quite well for her age/maturity, scoring within/above ideal in many categories, excelling in the following: E’s in Back & Dairy Character; V's in Head, Rear Legs, Feet, Udder Texture & Mammary; 36 Dairyness; 27 Rump Angle; 26 Rump Width; 27 Rear Leg Side View; 35 Fore Udder Attachment; 46 Rear Udder Height, 28 Arch; 37 Depth & 27 Side View. 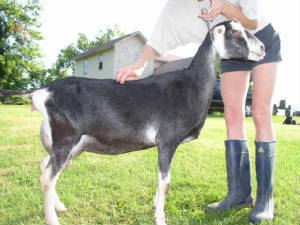 2007 Update: Roulette kidded with extremely nice 2 Buck/1 Doe triplets x Matrix! Roulette as a yearling first freshener . . .